This document was written to provide history on the struggle of Colombian GM workers at the Colmotres assembly plant in Bogota, Columbia. A number of injured workers, most of whom were injured on the job, have been fired from the plant. The ongoing occupation outside the U.S. Embassy in Bogota, which is referenced below, has been present for almost 600 days. Activity within the United States has been and continues to be in the form of pressuring the UAW to speak to General Motors to intervene and raising money to support the injured and fired workers. For further information, see this article published in the latest Against the Current and this interview with Jorge Parra published for the Webzine. More than 1,000 workers who were members of SINTRAIME went on strike against GM Colmotores in 1997. The strike was in response to the company’s refusal to negotiate with the Union, which was seeking to protect the gains made through past collective bargaining agreements. These included health benefits, housing, education, and housing improvement funds. Massive picket lines halted production for a month; workers armed with sticks formed self-defense units. The company retaliated by launching a campaign attacking the Union’s legitimacy, and illegally firing approximately 500 union members. Due to corruption within the Labor Ministry, GM Colmotores was not sanctioned for its violation of Colombian law. The company began to hire workers under a variety of inferior – mostly one-year – fixed-term contracts, denying new hires the stable employment, pensions and other benefits enjoyed by union workers. The union workers were steadily displaced by the new hires. Police paid by the company at one point were used to keep workers – whose names appeared on a list of strike participants – from entering the plant. 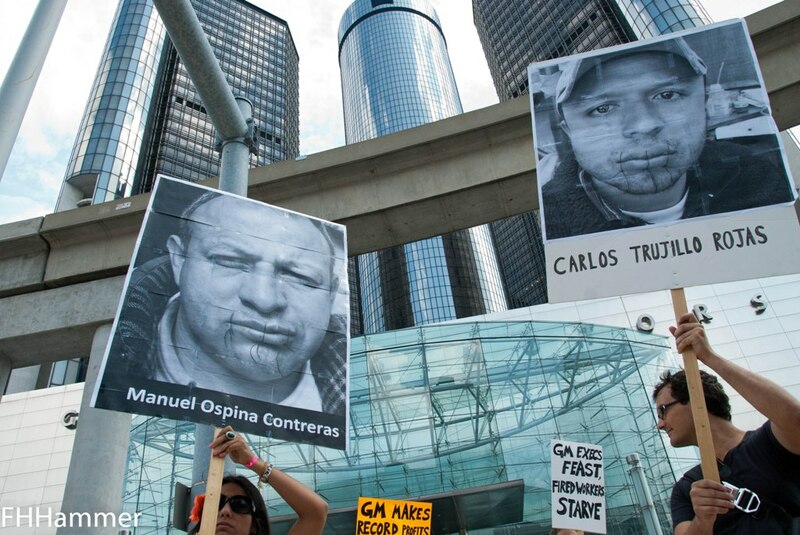 In 2003, in the wake of passage of new laws weakening labor rights, GM Colmotores fired an additional 300 workers who had less than 20 years’ service. Year by year, GM Colmotores laid off union workers, and pensioned those who aged out. This and the other actions described above explain why SINTRAIME has declined from 1,400 workers at its peak – out of a workforce of 1,800 – to 45 workers. The remaining members are protected by law from arbitrary dismissal, though a majority suffers from occupational injuries. Prior to hiring in on May 10, 2004 as a production welder at GM Colmotores, I had been a journeyman welder, having invested 3.5 years in technical training in welding and metallurgy. At the start of the shift one day after having worked a few months, the new hires were separated from the older union workers, and were directed to the cafeteria for a meeting. Those who belonged to the union were told to go directly to their jobs and begin working. The then-VP of Labor Relations Maria Lucia Sambrano addressed the 600+ workers who had gathered in the cafeteria, saying: “Today we are launching the new ‘collective pact’ for new hires, putting an end to unionized workers. I want to present your representatives.” She pointed to five workers who were obviously chosen by the company, as we didn’t have anything to do with their selection. From then on, GM Colmotores pitted the new hires against the older workers belonging to SINTRAIME, by creating an environment with clear differences and clear preferences. This produced a tense work environment. New hires were used to marginalize the union workers with the new hires, for example, receiving bonuses from which the union workers were excluded. The five “reps” selected by the company were instructed to pay attention to new hires caught talking to the union workers. ASOTRECOL, an association made up of injured workers and former workers from GM Colmotores, was formed in May, 2011 after nearly four years of filing complaints and building awareness among the workers. Unable to join a union, but realizing we must be organized in order to defend our rights and change conditions inside the plant, I and other injured workers and former workers formed ASOTRECOL. We documented the fact that many fired workers were suffering work-related injuries, and that GM Colmotores was blatantly violating numerous Colombian laws. We exposed corruption within the Labor Ministry (charged with protecting workers’ rights). We brought this to public attention when 68 members of ASOTRECOL set up tents in front of the U.S. Embassy, August 2, 2011, maintaining a 24-hour-a-day, 7-days-per-week presence since. 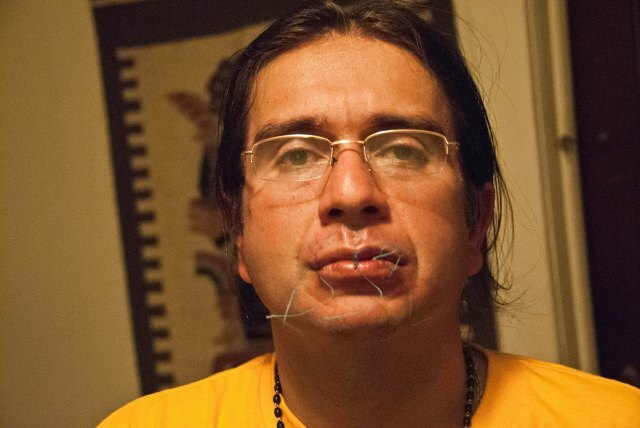 Jorge Parra, president of ASOTRECOL, sewed his lips shut in a final hunger strike on November 20, 2012. In retaliation for defending my rights and organizing my colleagues, not only was I fired, I also have been persecuted and threatened. Today my life is in danger. On one occasion, my truck was broken into, with threatening messages left inside. Two people who were following me on motorcycles and photographing me were detained and taken to a police station (only to be released). And my mother received “sympathy” cards in response to my supposed death, inscribed with comments that her son shouldn’t have been involved in certain activities. An order by the Attorney General of Colombia directing the National Police to protect me and my family has been ignored. Standing up for our rights as workers in my country is practically a death sentence. 3,000 union and labor organizers have been murdered in Colombia in the last couple of decades. Their deaths are often attributed to a personal conflict or common street crime. There is no guarantee that I will not be killed in retaliation for the allegations we have raised against GM Colmotores or the corruption we have exposed in public offices. If it were to happen, government officials and/or the Colombian media would likely say I was killed when a thief tried to rob my cell phone. That is the reality that union leaders and organizers face in Colombia. ergonomic conditions have been improved and injured workers have been relocated to different positions. According to Colombia’s primary newspaper, GM Colmotores is making much-needed improvements to its assembly line, including investing $6 million in the truck line where many of us developed injuries, which was attributed to intervention by GM HQ. One of our biggest accomplishments has been that current workers are more aware of their rights and the rights of injured workers, and the laws that protect the latter from arbitrary dismissal. Some of these workers decided about 10 months ago to form a new union inside the plant, SINTRAGMCOL. Now workers are refusing to join the collective pact (company union) and instead are joining SINTRAGMCOL to fight for their rights along with the older union workers of SINTRAIME. (Note: having more than one union inside a plant is allowed in Colombia; also, the presence of a union does not mean that union-negotiated rights extend to all workers, as described above). These two unions joined together about two weeks ago, with approximately 200 workers declining to take a paid temporary layoff, while GM Colmotores made improvements on the assembly line in response to the pressure that ASOTRECOL has generated. The workers are glad for the improvements to the line, which include: ergonomic improvements, installation of robots, and the completion of the new assembly line at its new stamping plant. But they were opposed to the company’s plan to pay workers during the layoff, only to recoup that pay by compelling workers to make up for those hours by working extra hours on their return while only paying their normal salaries. From past experience that’s meant 12-14 hours daily, 7 days per week. The workers belonging to the unions SINTRAIME and SINTRAGMCOL are resisting working the long days and weeks because they are aware that’s what’s responsible, in part, for their repetitive stress injuries. They weren’t willing to take the “vacation” time off, only to be required to make up the hours later at the expense of their health. This, despite the fact that workers do not receive any vacation time off, regardless of years of service, except for the holiday period around Christmas and New Year’s. Management’s response was to find work for the 200 workers to do. What will happen when the other workers are called back and the excessive hours get scheduled is anyone’s guess. 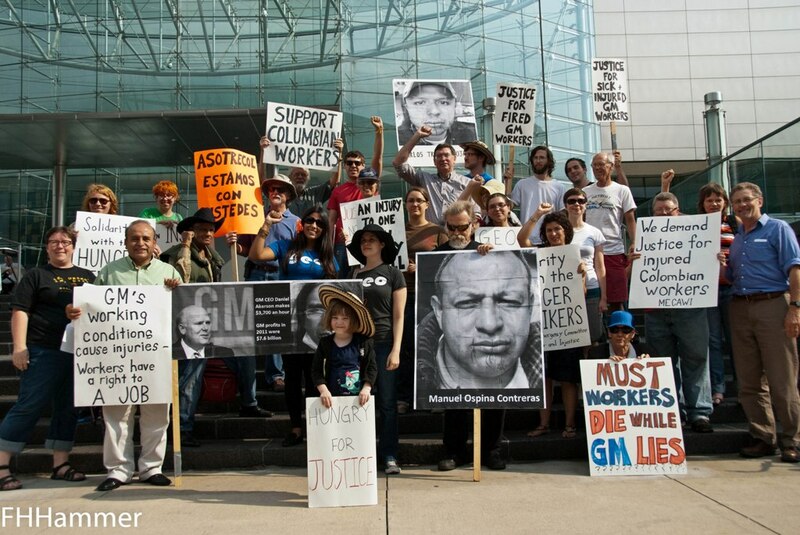 ASOTRECOL is nothing more than a group of workers who are seeking justice. Both SINTRAIME (the older union with more than 40 years of struggle inside GM Colmotores) and SINTRAGMCOL (the new union of injured workers) recognize that the struggle of ASOTRECOL is precisely what has changed many conditions within GM Colmotores. The information contained herein can be corroborated by Mr. Felix Arturo Herrera, President of the SINTRAIME labor federation and the SINTRAIME local inside GM Colmotores.